Multi-messenger astrophysics helps obtaining a more comprehensive understanding of events and objects in space by looking at different messengers and wavelengths simultaneously with different instruments. 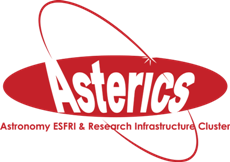 The astrophysical ESFRI projects will generate rich and complex, multi-dimensional datasets, and the exploitation of this unique combination of astronomy "Big Data" requires a common data infrastructure for data discovery , access and interoperability. Part of our mission is to engage with the general public as well as technical audiences. That is why we are developing citizen science experiments that address science questions, while involving the public in knowledge discovery.